It is with a great deal of sadness that I let you know that Beau has taken a turn for the worse. Over the past week, Beau's appetite diminished. By Friday, he had stopped taking water. In a last attempt, we took him to a homeopathic vet in Chestnut Ridge who prescribed a B-complex liquid that we gave him by injection, as well as other meds for his stomach. Unfortunately, his liver and kidneys are shutting down and we will have to put him down tomorrow. Michael, Meghan, Marie and I would like to thank you for your help, support and advice during this difficult time. It has been greatly appreciated. Anne, you and your family are in our prayers. It�s never easy making that final decision to help a beloved friend cross over. Thank you for doing all you could for him. It is with a very heavy heart that I am writing to tell you that my very special, handsome boy, Dakota, has crossed the rainbow bridge. While my heart is breaking, I know he�s at peace. Dakota started showing symptoms in November and was diagnosed with a very aggressive form of cancer. Still, he seemed to always be smiling and his heart was always filled with joy. When I was ill, he would come and lay down next to me with his head on my abdomen, waiting to serve. Whenever I dropped something, he would bring it to me. 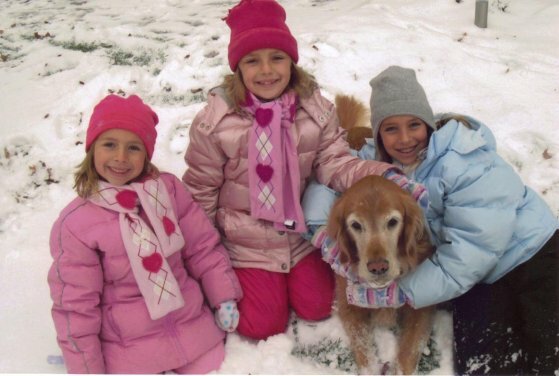 He didn�t walk around the house, he pranced and he made sure he was always within two feet of me, even at the end when he was ill. And he loved his two golden sisters, Daisy and Sammie. He would often spend time grooming both of them. We were all so proud of him when he qualified as a therapy dog. He never let his disabilities get in his way. Dakota was my foster failure seven years ago and he was my heart dog. Even with the two golden girls still here, the house seems so empty and lonely without him. He was a special needs boy who taught us everyday that when life gives you lemons, you make lemonade. He is missed more than we can say but we promised him that someday soon we would find another special fur boy to help. Stephanie, we�re so sorry to hear about Dakota. He was indeed a very special Golden. 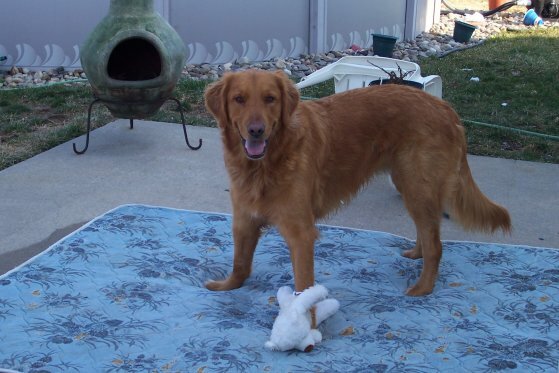 Dakota is watching over all of you and when it�s time, he�s going to send you another special needs Golden to share your home and your heart. In the meantime, may you have many fond memories of your time together. How are you? Julie took this picture today after she tried to get one of Maxx lying next to Lucy with his head resting on her body. I have Lucy in an agility class for beginners and I think Maxx would do very well in the same class but I wanted to check the class out first. He is doing very well here and I would say he fully adjusted to living here and has his own space in our kitchen when we go to sleep. We don't crate Maxx anymore because of space constraints for two crates and if we had the need we would. But he is great and very happy as you can see in the picture. We will ask you to baby sit Maxx this year if you have the room so you can enjoy him. By all means you are always welcome to visit him. You take care and keep in touch. Everything is going well!! Maxx fits right in with the family. He and Lucy play nice and run after each other, they get along very well. Maxx is a tough cookie. He will persist with his much bigger body and knock a toy from her mouth and you would think she would go after him, but she doesn't. She, in some ways, is the less dominant one. In the morning they are quite wild with excitement. Did you say that you don't pet them until they sit nice?? He's still a big eater and will go in her bowl as soon as she is finished. Usually there is nothing left, but sometimes he hits the jackpot with a couple of kibbles!! Maybe one day we can get together and you can see him. Hi Tom & Julie, thanks so much for the Maxx updates and the pictures. We�re glad that he and Lucy are having so much fun together. It sounds like he�s still a barrel full of energy and would probably do very well in an agility class. We all know that a tired dog is a good dog! It's been a while since we sent an email with an update about Hutch who we adopted in 2004. After reading about all the lost love ones this past year I felt it was time to send an update for Hutch. He's coming up on his 5th birthday in two months and is doing fine. While he is still afraid of being left outside for longer then he wishes he is just fine. I guess the only way to put it is that he's a house dog and big lap warmer as he loves to cuddle up and keep us warm in winter months. He loves to lie in front of our wood stove and soak up the heat. How he and Cassie, our other Golden, can do it I sure would love to know. He has started to show he is a mature dog now with a little gray chin showing and a touch of fat belly from being a chow hound. He has one major problem - it's the stickiest set of Velcro ever made. He�s always at your side or right on top of you as close as can be. I know it's not much but he is safe and happy in his new forever home. Attached are a few shots of him now. 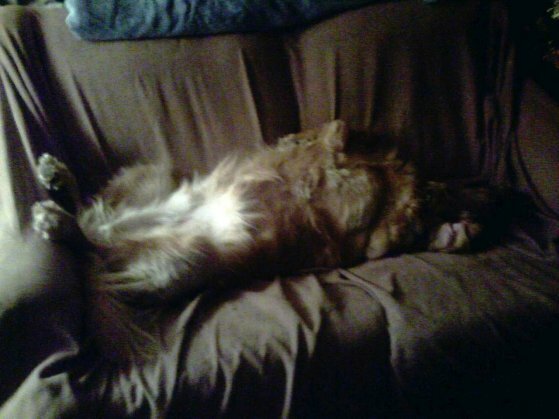 The last one I caught at 2 am � he�s sound asleep on the love seat. The flash didn't even make him move. I guess he's adjusted well to his home. Thanks so much for the update and the pictures Charles. We can�t say that we blame Hutch for being such a Velcro dog and for preferring to be indoors rather than out. It had to be very scary being lost and stranded along the side of the Hutchison River Parkway! I feel terrible, but the holidays just got away from me. I had taken a picture of Jersey with antlers on to send you for the holidays and never got the chance to get it off the camera and send it. Jersey is doing great. He got another pillow and a bunch more toys from Santa for Christmas. He is going a little stir crazy being inside so much. We take him for walks but it isn't enough. I'm sure he misses the visits to the dog park where he can run free like a maniac. With the on again off again weather the dog park has been closed. He took his first major trip back to PA with us over the holidays. We were super nervous bringing him into my sister's house and my mother-in-law's house because they have a lot of knick knacks. But he was a real trooper and behaved wonderfully. I promise to send pictures soon!!!! Mike, we�d LOVE to see the pictures of Jersey in his reindeer antlers! We�re glad he was such a perfect guest over the holidays. She is sooooo smart!! Things are going well; she rules Samantha. They are very cute together. It has been very cold, in and out, in and out.......we did rename her Valarie. So it�s Sam and Val. Thanks for the pictures Jan! The picture of Valarie and Sam is absolutely adorable. She is the sweetest little puppy. Please, please continue to send us pictures as she continues to grow! With much sorrow I must inform you that our beloved Doc was put to rest on Sunday, January 27th. He had developed a cancerous mass on his spleen that spread quickly to his liver. He was a great companion to our residents here and will be sorely missed. Thank you for allowing us to have 7 wonderful years with the most precious angel. Judy, we have to thank you and the rest of the staff for giving Doc such a wonderful life. Your hospital was the perfect solution for his separation anxiety. He was never alone and got to receive and give a lot of love and joy from everyone he encountered. Words cannot express my deepest thanks to GRRI for giving us Doc. The days after he passed so many residents, staff and families have expressed their sorrow in his passing. I never realized how many people looked forward to seeing him during the course of a day. He was such a Golden, brightening people�s days just by being him. Judy, you said it perfectly. He WAS such a Golden and bestowed that wonderful Golden personality everywhere he went. He was a terrific ambassador for the breed. Just some recent photos of our princess Lucy enjoying the outdoors. I hope everyone is well. Lucy sends licks and love. Hi Pam, the princess looks wonderful! Thanks for the photos. We are doing great with Riley. He is SUCH a sweet and well mannered boy. He gives lots of kisses. He loves his new dog bed and seems to be settling in nicely. He�s a lot less concerned about the urban noises around the neighborhood, acts much more like they are old hat. I�m sure he misses you and the rest of the pack, but he seems to like us too. That is one big dog you are now fostering! 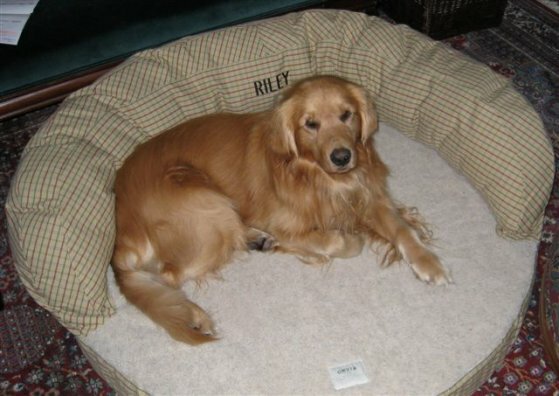 Riley looks VERY happy in his new personalized bed! Yes, Olivia�s new foster dog, Ryan, is a bruiser, weighing in at a hefty 110-lb. I hope this finds you well. We do apologize for not sending greetings at holiday time. Sonny continues to delight us daily. Some months ago I thought I would see if he would tolerate being vacuumed. He seemed quite unperturbed by the vacuum in general, so, one day, with a little coaxing he came when called (with no wrinkled nose) while I held the hose. He wasn�t thrilled but nonetheless came. He tolerated the experience and was rewarded with much excited praise and a treat. Well we have progressed considerably since that first attempt. Now I can sit by the vacuum, ask him if he wants to be vacuumed, and he will promptly come and lie down in front of me while I run the hose up and down his back. Of course a treat is expected and given. Recently we �baby-sat� my son�s dog, a chocolate Lab named Max. Max has been here before and Sonny is just a saint about the interloper. Max is not as well behaved as Sonny and must be on a leash when outside. When I would take Sonny and Max outside, Sonny would kind of stand, look at Max and then run around the yard free as can be almost as if he was teasing Max. I could easily imagine Sonny saying, �Na na na na na.� Sonny never took to the bed that we bought for him so we gave it to my son for Max. Max is quite attached to said bed. So When Max came for several days his bed came too. Now Sonny was quite intrigued with the bed, and I had to tell Sonny that the bed was no longer his. I guess they are not much different from young children. Anyway, all is well and we are so glad that Sonny lives with us. Sonny sounds like quite a character. Hum, maybe Dyson should use him in a Dyson Animal vacuum cleaner commercial! Talk about vacuuming up dog hair! How are you? Hope you and all your canines are fine. Are you fostering anyone at the moment? Just wanted to give you an Amber update � she is an only child. I put Kate down in January � her cancer had returned and was growing at an alarmingly fast rate. It was and is very sad. I still expect to hear her tail thumping when I go down in the AM and all of us still use her name at times instead of Amber. Amber seemed a little sad initially, sat on the blanket that was Kate�s spot. However, now I would say she�s enjoying being the one in the spotlight. She charmed everyone at the vet last time she was there, everyone. She peeks through the glass on the door, sticks her head out the door of the examining room � even the vet, who is nice, but not an over the top kind of person really likes her. Every now and then she steals one of Rich�s slippers or my slipper or flip flop, goes somewhere and lays her head on it while she sleeps. Cute, huh? Of course, it doesn�t happen consistently enough so that when one of us can�t find a slipper/flip flop we search all over before realizing where it probably went. Last month we added Baxter, a 10 month old rescued cat to the household. He is so funny and social. Right now he�s in Taylor�s room and Amber sits on the other side of the door with her nose to it. We�ve introduced them a couple times but Amber is a little too friendly. Not sure how we�re going to transition this as Baxter is finally at the point where he wants to leave Taylor�s room. I�m sure it will be fine eventually, just not sure how to get over the hump here. Anyway, that�s the news here. Donna, we were so sorry to hear about Kate. The brothers are doing great. Attached are some pictures of Shylow & Sammy. The first is of Nicholas who fell asleep on the couch with Sam. I threw out an old sofa bed. To make it lighter in weight I removed the mattress first and placed it on the back patio. Right away the boys took it over for their wrestling mat. I will be tossing that soon because my wife claims it gives our yard the "Redneck" look. Remember, if you keep a mattress in your backyard, you might be a �Redneck�. But hey, the pups love it and its still winter. Talk to you all later. Vince, you never cease to entertain us with your emails. We love the picture of Shylow on his wrestling mat. Now how can you break his heart and throw it out? So far so good. Chewey has been a perfect gentleman. After several attempts to get up on our bed - he settled in nicely on your blanket and spent a quiet night. We all left for work about 8 am this morning leaving him with the run of the living room and kitchen (we closed the doors to the dining room, bed rooms and bath rooms). I came home from work at 1 pm expecting the worst - but everything was fine. We went for a long 3 mile walk in Johnson Park at the end of our street (he is a little bit of a hand full - but no worse than other dogs we have had. I am sure he will get much better). He was pretty tired when we got back and laid at my feet as I worked from home for the rest of the afternoon. He seems to be a "woman" dog - spending most of last evening with my wife and daughter watching TV upstairs as I stayed downstairs. When Carol came home at 5 pm, today - he immediately abandoned me and went upstairs to be with her. We are all very pleased with him. We will probably take you up on your offer to watch him when we go to Atlanta. Hope you enjoyed the play. I will take some pictures and send them to you soon.. Thanks so much for the Chewey update Vince. We�re glad he�s settling in and behaving himself and NOT living up to his name! Marty and I wish to thank you for your letter of sympathy about Patton. It is surely helpful. We are still sorrowful and lonely without him � worse at Christmas! I�m enclosing a photo of him which you might enjoy. We just can�t resist �Old Gold� powdered sugar faces. Thanks so much for sharing it with us. It has now been 1-1/2 years since we adopted Tyler (Ty). He is now 5 years old, and is having the time of his life with his brother Toby. Tyler has been a joyful addition to our family, and it feels like he has been with us forever. Though Tyler still experiences some discomfort from allergy problems, it is nothing like what he had when he was first rescued by GRRI. We thought it would be quire difficult to handle the allergies but we found it to be easy as long as we watch what he eats. They seem to come out more during the spring and fall, mostly scratching. But we take care of it as we do our own allergies. It doesn�t seem to bother Tyler at all. Tyler and Toby are inseparable. Everyone thinks that they are twins because of the difficulty in not knowing who is who. It took us a few weeks but we definitely know the difference. Tyler, though not a kisser when he first arrived, is finally giving little pecks once in a while. I can definitely say he is mommy�s boy. He shows affection in different ways. No matter what, he knows that he is loved. He still continues to bite his nails, funny as ever, and lets us know that all the toys and bones in the house are his when he wants them. He does share on occasion. We�ve enclosed a couple of pictures to show that he is still as handsome as ever. Also enclosed is a donation to GRRI on behalf of Tyler and his brother Toby. Thank you all again for everything that GRRI does. 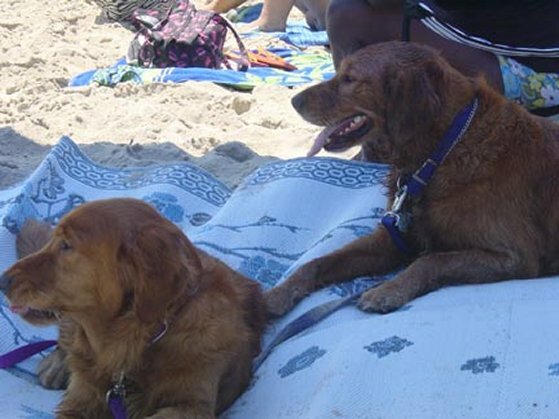 Without your organization where would all the Golden Retrievers be that you�ve placed in forever homes? Toby & Tyler sure do look like identical twins. We can see why people get confused! I had to write this letter to tell you the story of how I came to find your site. For the past twelve years we have owned two Labrador Retrievers, Nala, a beautiful yellow, and Savannah, nine years Nalas junior, a sweet black. Savannah treated Nala as she would her mother and Nala returned the love to Savannah. In July Nalas� back went on her and at the young age of 12-1/2 we had to help her over the rainbow bridge. Savannah was devastated. She stopped eating, her habits changed, and she gave myself and my family a real scare as we thought we were going to lose her too! I took her to our vet to make sure there was nothing physically wrong and discovered what we all thought was the problem. Savannah was mourning. The girls in the office fawned over Savannah and when we emerged from the examination room there were a bunch of smiling faces, one with a business card in her hand. As she handed me the card I asked her what it was. �That�s your new dog" she said. She proceeded to tell me of a couple from our neighborhood who were getting a divorce and neither one could take the dog. They told me he was so sweet that they could not let him wind up in a shelter. I saw that he was a Golden., and after a few phone calls back and forth, and a few visits, we were given custody of Casey. At the time Casey was 1-1/2 years old. Other then occasional meetings with Goldens at our local dog park, I have not had many dealings with them. But the little I had read about them told me they were from the same mold as Labs...boy was I wrong....LOL. Savannah did not take to Casey right away. As much as he wanted to get to know her, she gave him the cold shoulder. But she started eating normally again and slowly started to return to her normal self. Now they are inseparable and Savannah is the mother to this clownish boy. She tells him how to behave and he listens to her every word (I swear they talk!) 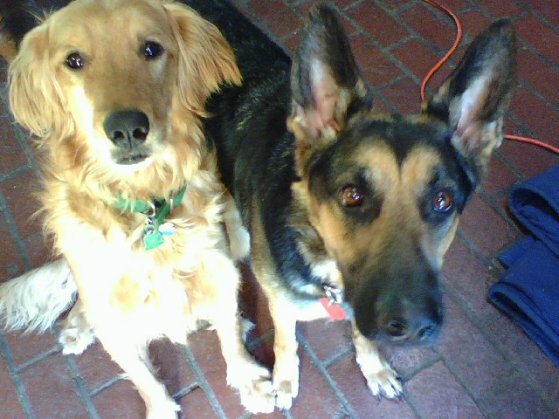 He saved Savannah�s life and quickly made a Golden lover out of the rest of us. For some reason he and I bonded quickly. I could not go anywhere without him right in the middle of everything and I can�t imagine being without him. The three of us now spend untold hours in the woods and at the dog park. I now know what all this Golden craziness is about. I have never met a breed so loving and so sweet. And I look at them in a completely different way. When I found your site and read all the stories and letters I realized how great this breed is and what important services you people at GRRI are providing. Kudos to you and your volunteers and I look forward to supporting you and your organization for a long time. Yay�another Golden convert. 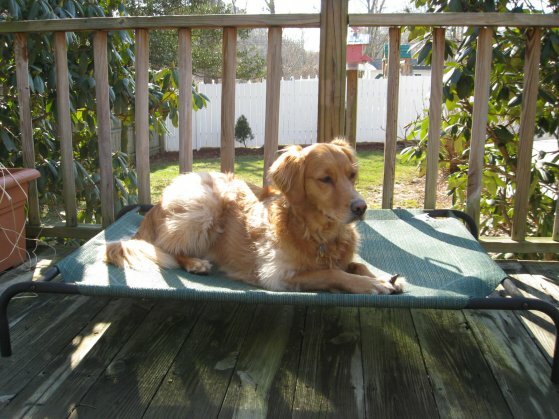 Yup, we agree�there�s NOTHING like a Golden! Did you know Goldens are like potato chips? You can�t have just one! Just wanted to say hello & let you know that "Glenda" is fabulous! We adopted her August of 2006, 3 months after my Golden "Hunter" was put to sleep. She has filled our hearts with love, especially mine since all my girls are in school now. I was heartbroken coming home every morning after taking the girls to school; I knew I needed another dog. My husband was right by making me wait a few months until after the summer to adopt a new dog. Not only was he not ready, but it would not have been fair to leave a newly adopted dog everyday while venturing out with the kids. Glenda has adjusted well to her new home & is a wonderful addition to our family. She loves my children so much & the girls, in turn, give her so much attention. Their favorite thing to do with her is to put pieces of dog cookies on their bellies. They love that the dog slobbers all over them! Glenda even sleeps on my 9 year old daughter's bed every night and borrows her blanket. She is a terrific companion & loves to go for a ride in the car. I could not have picked out a better dog myself! Thank you for taking the time to match up a great dog for our family. We all have tremendous love for her. Cindy, thank you for an absolutely adorable picture! We all loved the part about Glenda being able to eat dog cookies off the girl�s bellies. Enclosed is my check for $25 as a donation in memory of �Mattingly� Bender, a wonderful rescue who brought 14 long years of happiness to my friends. We�ll be sure to use this memorial donation to good use helping other wonderful rescue dogs. Thank you! It is with sad hearts that we write to acknowledge the passing of beloved Golden, O�Hara McFadden. Please accept the enclosed donation in his memory. I got to meet Sofia today with her foster mom, Amy! From the bottom of my heart, I hoped that it would be a great match for Buzz and Sam, but unfortunately it wasn't. Sofia is an adorable and loving girl! She is going to make a family very happy!! Meeting Amy was a delight! She is one of the most unbelievable people I have ever met! Her love and concern for Sofia was amazing....she is truly a gifted person and GRRI is so lucky to have her helping our golden friends! What a special, special person!!!! I am going to make a donation today for Sofia. I would also like to make another for her Cowboy~ that she lost! Thank you again for all you do and I know there will be a brother or sister for Sam and Buzz in the future from GRRI!! Cami, thank you so much for your double donation! We�re sorry the play date between Sofia and �the boys� didn�t work out as well. We are so sorry about your loss, are hearts are sad with yours. Val is doing just fine. She sleeps with Jeanette on the bed on the pillow - as I told Jeanette, cute now but add 50lbs. She has been house trained (goes to the kitchen door and barks) for the past 3 weeks. Her shots will be complete Friday and we can't wait to walk her. She is enrolled in basic training at St. Hubert's and will start next week. The cats? Well she is curious but cautious. Cosmo is 11yrs old and just had cancer surgery, so he is confined to the bedroom where Sam and I sleep BUT before the operation he would not let Val scare him, after all this IS his house. As soon as Cosmo is back into the fold he will continue to teach Val some manners. She sits, stays (a little), and sleeps after she is sure everyone else is up and about. Val is a fence jumper, thank god ours is 5-ft. high. Sam and Val are adorable together - they play, steal each others toys and treats, and share the dog bed in the kitchen. See photos. 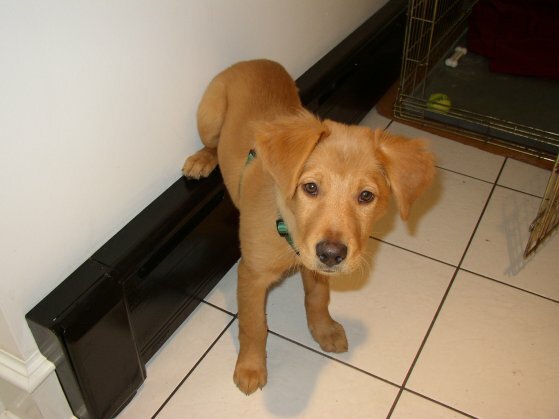 She is soooo weird, she sits on the heater. Jan, she�s soooo cute! She�s going to love going to school at St. Huberts. They have a wonderful training program. Chewey is doing just fine. He has adapted well to life with us and gets more than his share of attention and love. His behavior is getting better every day. He has been to the dog park 4 or 5 times and has a great time. At times there are 25 to 30 dogs there and he does well with almost all of them. You should see him trying to keep up with the Greyhounds - other than the Greyhounds he is the fastest dog in the park and by far the prettiest. His walking on a leash is getting better - he still has a problem when he sees other dogs and wants to play with them - but we are working on it. I am working with him off the leash outside (under controlled circumstances) and he shows no desire to run away. He has not had a accident in the house - he sleeps all night on his bed on the floor - he only comes up on the bed for a few minutes before going to sleep and in the morning. We couldn't be happier with him and I think he thinks the arrangement is ok too. We really appreciate you taking him for the weekend. Talk to you soon. Vincent, we�re so happy to hear that Chewey has settled in and has already made a bunch of friends at the dog park. He�s such a party animal and loves to play. What a great outlet for all that doggy energy! We are doing GREAT! Sara quickly became a member of our "pack". She is pure joy. Right now I am babysitting at my daughters and Sara and Stella will spend the night with us here. They both love having the back yard to themselves and have been running and chasing each other all day. It has tired out my granddaughter so that I am certain she will sleep all through the night! I will send more photos as soon as I get home. But she is doing wonderful and I am feeling better from the pneumonia. Unfortunately, my back has not been doing so well. I have had to see a neuro surgeon, MRI's to follow, and perhaps back surgery in a month or two. Whatever comes my way, I am ready. Katherine, thanks for the update. There�s nothing like fresh air to tire out dogs and children! We have very sad news in the loss of our wonderful golden boy, Buddy, who passed away suddenly due to gastric dilation. We adopted him in 2004, and four years was much too short a time for us. He had slowed down a bit in the past few months, eating well but losing weight. Our vet did diagnostic blood work and x-rays, but found these tests to be inconclusive. Also, Buddy�s vision had weakened due to cataracts, and he had started to hug the wall to feel safe when coming down the stairs. He sometimes did not see the deer running in the woods behind our home. Due to his health, we actually think Buddy may have been older than originally reported, perhaps 12 or more, but he was frisky and loving until the end. He seemed to be feeling better of late, and he proudly paraded with us up the block last week, barking at his dog pals along the way. None of us anticipated the tragedy that was to come several hours later. We rushed him to the emergency hospital in the middle of the night when we saw his distress. He died there peacefully while we were still discussing treatment alternatives with the vet. Buddy decided himself that his time had come. 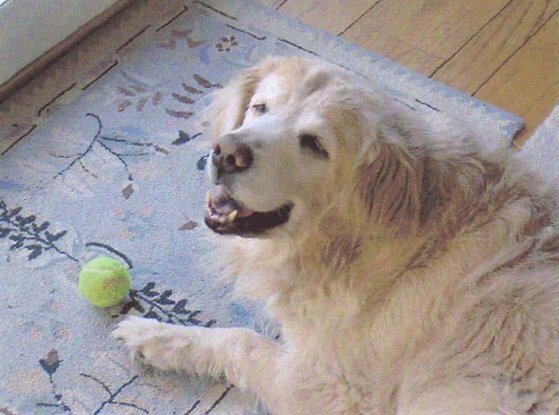 We miss his loud �talking,� his presence with soft toys under foot, the thump-thump greeting of his tail on the floor, and the jingle of his collar. Buddy had �baggage� and a quirky personality from whatever happened in his early life, but many of his fears seemed to be tamed with love. We are comforted to think he found happiness, trust, and belonging in our family. Buddy will remain in our hearts always. We want to thank you again for your wonderful work, and also for matching us with our very special Buddy boy. 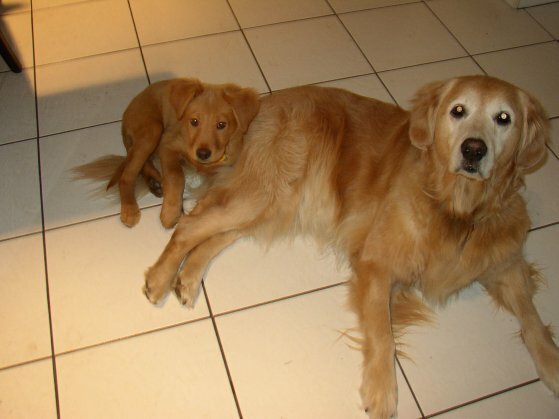 Amy, our condolences to you and your family; Buddy was such a beautiful Golden. We appreciate your generous donation in his memory. So many of the Goldens in our care right now are requiring expensive medical care and your donation will help us help them. You�re right, you�re time together was too short.